I always look forward to mid-March, despite the unpredictable weather and the feeling that winter will never end. For me, the perfect tonic to all that is Canada Blooms. Last week I helped plant gardens and containers at the show. Being surrounded by flowers in bloom and trees budding out lifted my spirits and whetted my appetite for the challenges and changes that come with spring. The gardens at Canada Blooms are a treasure-trove of design inspiration. Although these gardens are designed to accommodate thousands of visitors in climate-controlled conditions, they are still an inspiration for our own gardens. Look carefully and you will find lots of interesting details that can add just the right touch to your garden. Here are a few of the ideas and themes that impressed me the most. The colour combinations throughout the show are gorgeous. The signature flower of Canada Blooms this year is the hellebore. Although there are many, many different varieties on view (be sure to check out the selection in the Toronto Botanical Garden’s brilliant Pop-Up Shop – G5), ‘Pink Frost’ seems to be everywhere. In the Unilock Celebrity Stage gardens, this cultivar is combined dramatically with dark purple and pink miniature calla lilies and velvety dark purple coleus. For a more delicate combination, take a look at the round garden bed in the Unilock garden (G9), where ‘Pink Frost’ is planted with silvery purple Heuchera, white frothy Euphorbia ‘Diamond Frost’, and creamy foxgloves. The plants in the Elite Environments garden (G16) pop against the dark painted fence. Keep an eye out, too, for ‘Orange Ruffles’ coleus, paired in several gardens with lime green and dark purple coleus. Water features continue to be a strong design element. Once again the Genoscape garden (G7) has soothing ponds and waterfalls, and the stone pillar planted with moss under a rain-like fountain is delightful. Visit the Kent Ford garden (G21) to see a novel use of water. This is not your Grandma’s fountain! The water drips from copper pipes on a large pergola into a pool. Thin copper pipe used consistently throughout the garden contrasts beautifully with the massive rough wooden posts and beams. 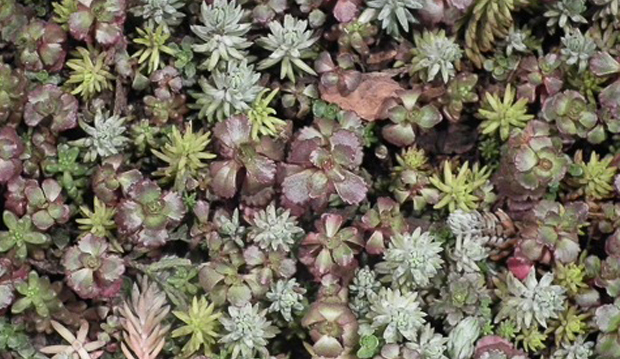 Groundcovers in gardens are not new, but Mori Gardens at the Wine Sensory garden (G8) updates the look with red and green ground-hugging sedums at the base of low white stucco-and-stone walls. In the Remax garden (G31A), Plant World replaces the lawn with white heather to harmonize the white elements in the garden. If you follow any garden design blogs, you will know that green-roofed garden sheds and chicken coops are the latest in eco-friendly elements. Creative Garden Design (G33) takes it one step further with their clever sedum-roofed abode for man’s best friend. Fences do not have to be boring or expensive. Sheridan Nurseries (G30) has trained ivy on a standard metal grid to create a textural wall of green leaves that provides year-round privacy while allowing good air circulation. Aura Landscaping (G18) takes it up a notch by combining ivy-covered steel mesh panels with a panel of stacked cedar flower boxes. Hellebore ‘Pink Frost’ in the boxes is a sophisticated-looking choice, but they would also be splendid (and tasty) planted with vegetables and herbs. When I travel in Europe, I am always impressed by the exquisite patterns found in sidewalks, pavements and paths. Intriguing garden paths can lift a garden out of the ordinary. Parklane Nurseries in the Tourism Ireland garden (G34) has used an elegant metal grid filled with stone dust in combination with varied cobbles to give a very European feel to this garden. Standing stones and sculpture add a dose of Irish whimsy. The manufactured perfection of the gardens at Canada Blooms can be overwhelming at times. Bienenstock Natural Playgrounds in the Canadian Wildlife Federation garden (G29) reminds us that natural and re-used materials belong in the garden. Natural materials provide interesting experiences for our children, while connecting them to nature, attracting wildlife and being gentle on the environment. 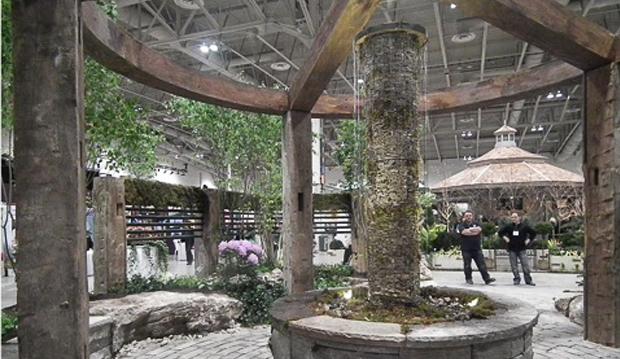 Dry stone work–building with stone without using mortar–is an ancient technique that’s front and centre at Blooms this year. 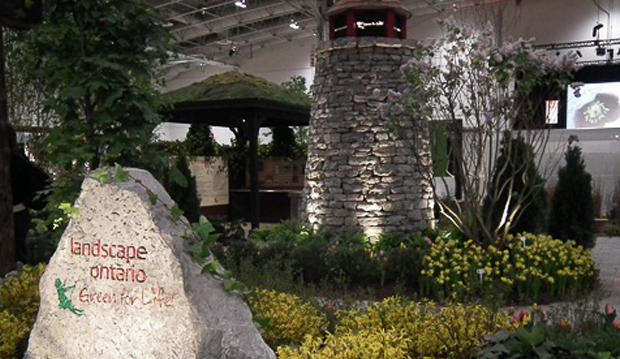 Landscape Ontario (G9) has built a magnificent dry stone lighthouse in their garden. The structure is wonderful, but watching it being built was even better. You can see Mark Disero’s video of the process at http://www.youtube.com/user/CanadaBloomsVideo. There is an interesting dry stone wall with viewing ports in Ron Holbrook’s garden as well (G4). 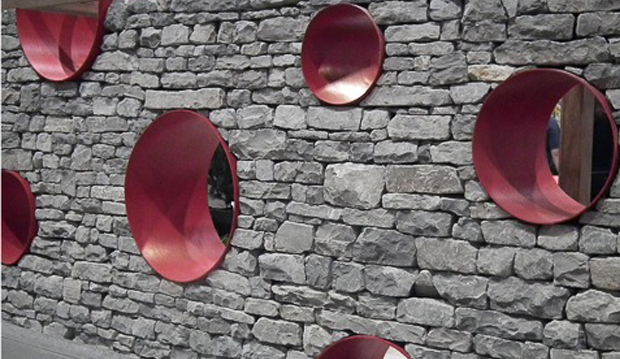 The round, bright red metal portholes are a striking contrast against the natural colour and rough texture of the stone. Although most of us do not have room for a lighthouse or a large wall, natural stone features are a classic addition to any garden. Succulents and air plants are all the rage this season. The TBG Pop-Up Shop (G5) has delightful arrangements on display and plants for sale. Whether you use them in containers, troughs or in gravel gardens, they add a touch of the exotic. Just remember that air plants (Tillandsia) and many succulents are not hardy here and must be over-wintered indoors. Containers are used extensively throughout Canada Blooms. My favourites this year are the birch bark-covered containers in the “Magic of Spring” display (G19). The texture of the bark transforms ordinary to outstanding. For a pop of colour, check out the wall of brightly painted sap buckets on the wall of the Via Rail / Canada’s Garden Route display (G28). A collection of plants in pails painted in complementary colours will add spirit to a deck or patio. I love Atlas cedars, especially the weeping blue ones (Cedrus atlantica ‘Glauca Pendula’). They can be trained into wonderfully sinuous shapes and have short, soft, blue-green needles. They are just hardy here in Toronto and may even need some winter protection north of St. Clair Avenue. In the Pacific East garden (G3) the soft, pendulous form of these trees make a beautiful contrast against the surrounding stark white wall, standing stones and grey beach pebbles. If you keep texture and form, as well as colour in mind, effective contrasts can be created in any garden. Canada Blooms is a great source for design ideas. With camera and notebook in hand, you are sure to find plenty of inspiration at this year’s show. Don’t miss it.